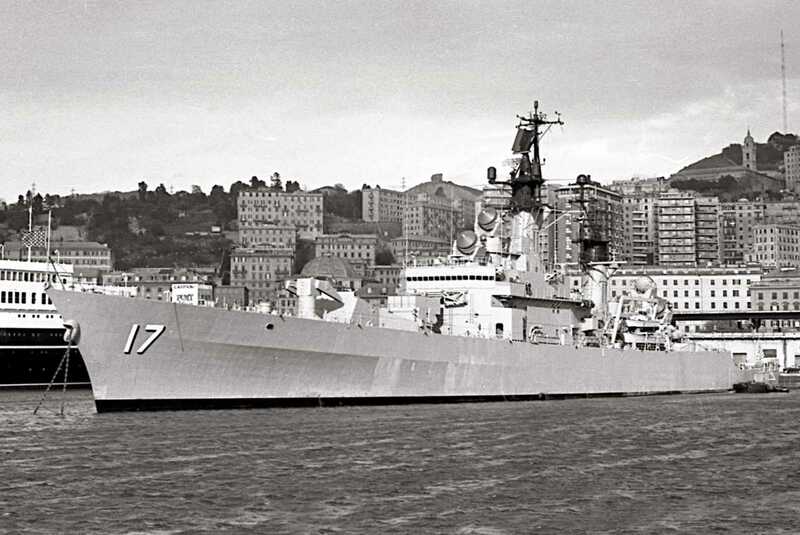 Armament 2 Terrier 2x2, (80 Missiles) 4 x 3"/50, ASROC (8 Missiles) 6 x12.75" TT. 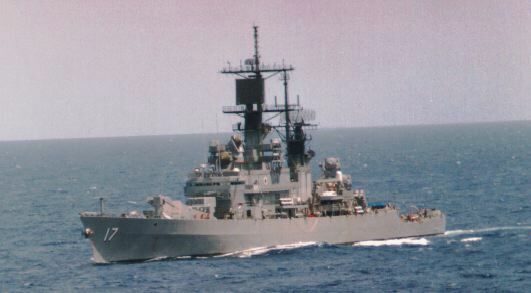 Speed, 34 Knots, Crew 377. 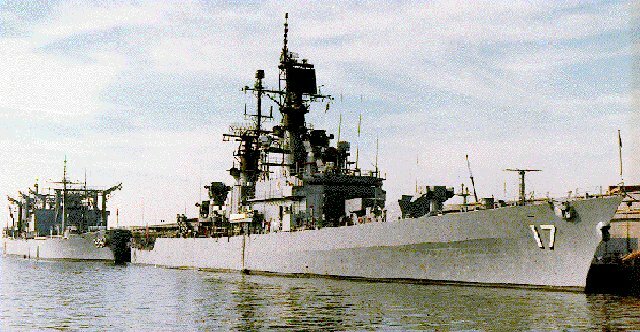 Fate Sold for scrap. 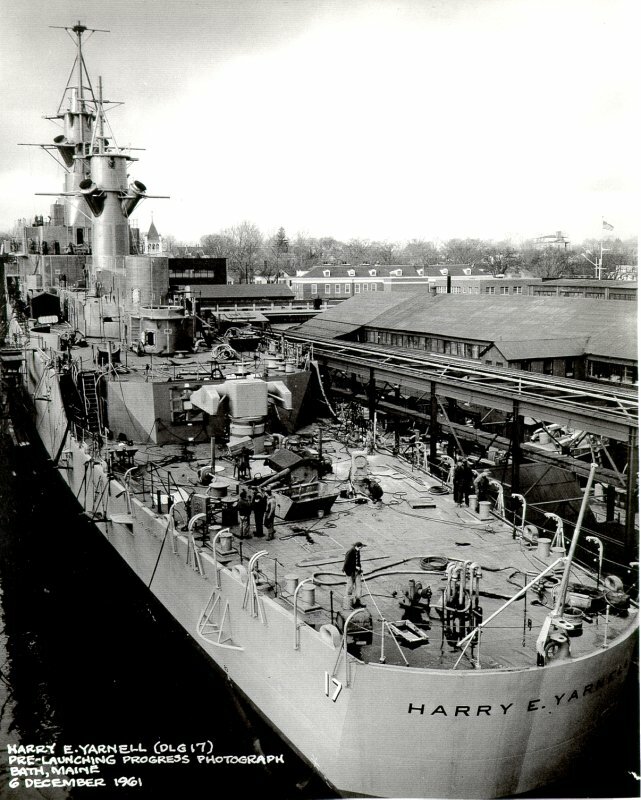 Scrapping completed 17 APR 2002. 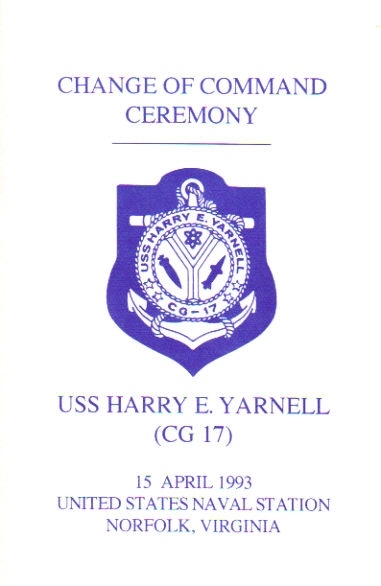 10k Harry Ervin Yarnell, -born near Independence, Iowa, 18 October 1875, began his naval career which spanned 51 year and 3 wars, when he entered the U.S. Naval Academy in 1893. 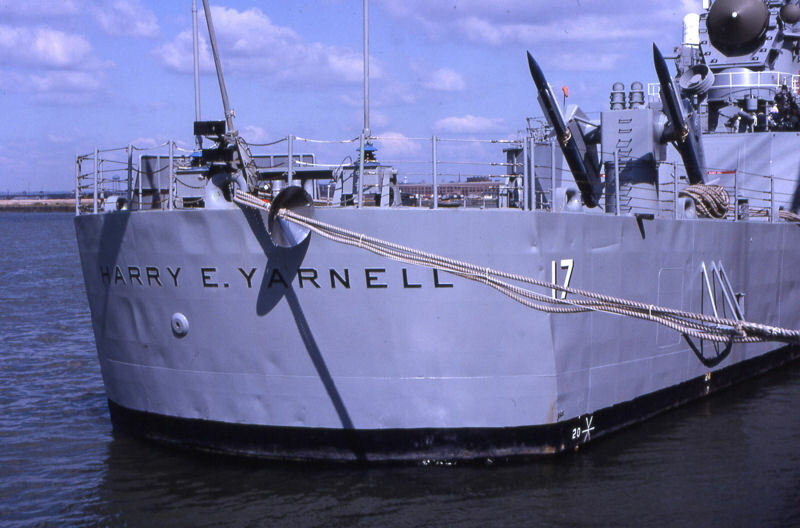 After serving in Oregon during the Battle of Santiago, 3 July 1898, Yarnell was commissioned ensign 1 July 1899 and reported to the Asiatic Station. He served in the Philippines during the Aguinaldo Insurrection and on the China Station during the Boxer Rebellion. 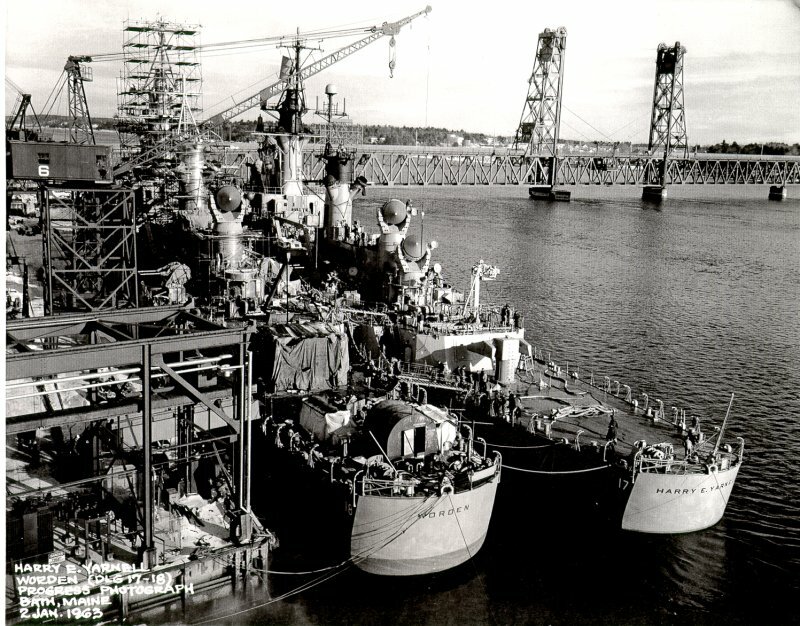 From Asia Yarnell reported to Connecticut at her commissioning, and sailed around the world with the Great White (Fleet Next, duty at the Newport Torpedo Station, on CINOLANT's staff, and at the Naval War College occupied him until World War I, when he served at Gibraltar and London. 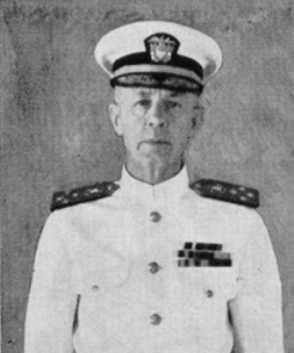 Yarnell then rotated 'between sea and Shore duty until ordered to Saratoga September 1927, as prospective commanding officer. 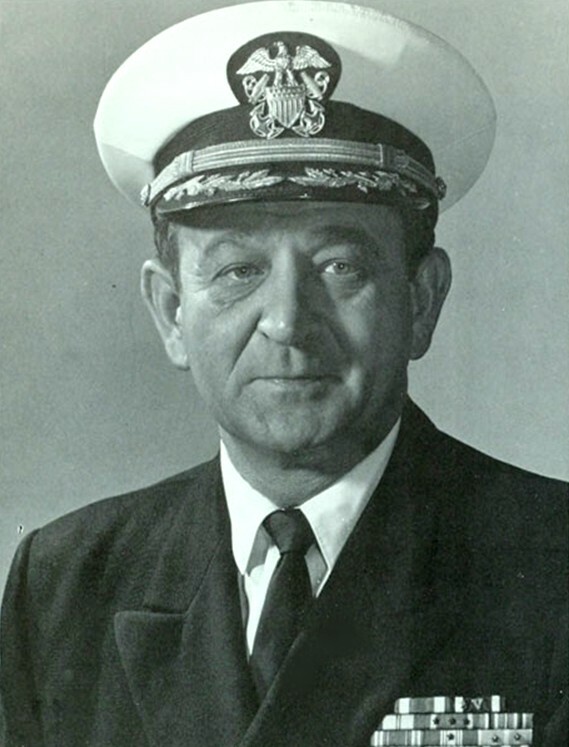 He served as captain of the carrier from her commissioning until 17 August 1928, when he was appointed Chief of the Bureau of Engineering as Rear Admiral. 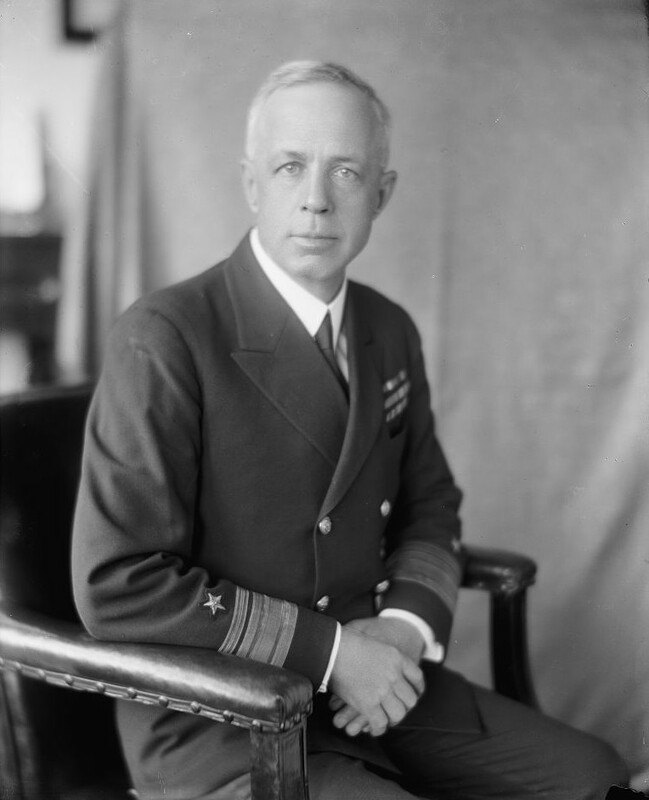 From January to April 1930 Admiral Yarnell was Naval Adviser to the American delegation at the London Naval Conference, and in October 1936 he became commander in Chief, Asiatic Fleet, with the rank of Admiral. 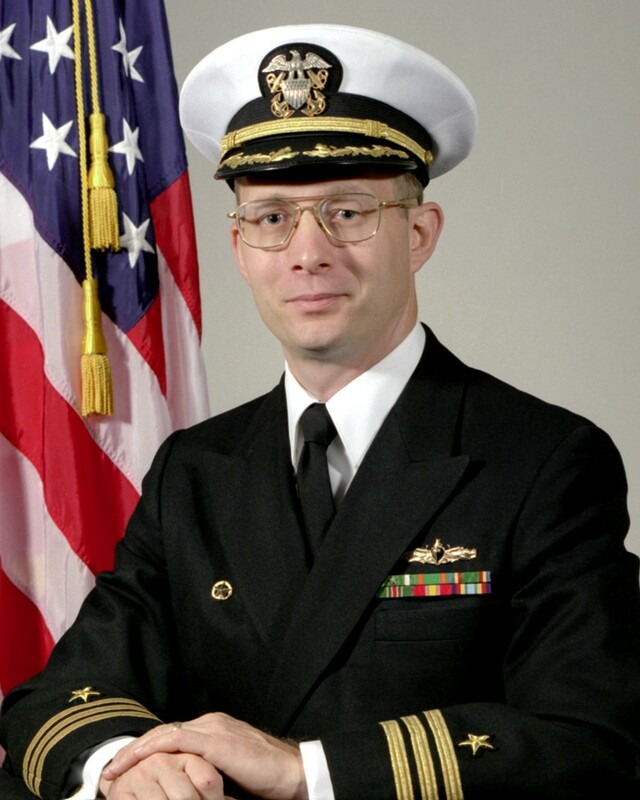 His tour there was notable for the sagacious and firm manner with which he handled a most explosive international situation. 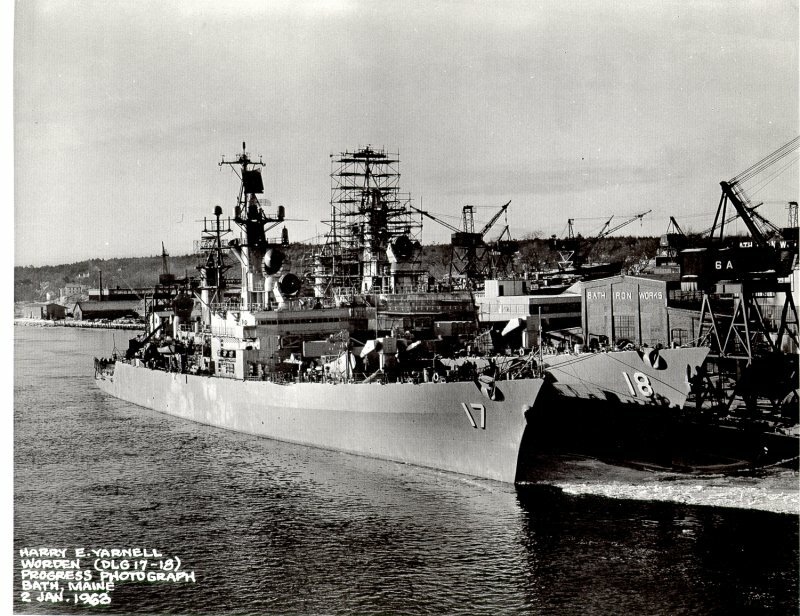 After 3 years service, Admiral Yarnell was transferred to the Retired List; but, 1 November 1941, as war loomed in the East he was recalled to the office of the Secretary of the Navy as Special Adviser to the Chinese Military Mission. 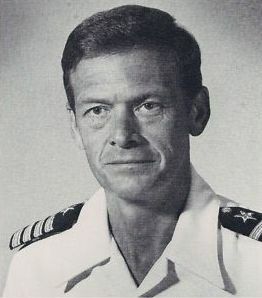 Admiral Yarnell was relieved of active duty 15 January 1943 but returned in June as Head of a Special Section in the Office of Chief of Naval Operations until December 1944, when he again was relieved of active duty. 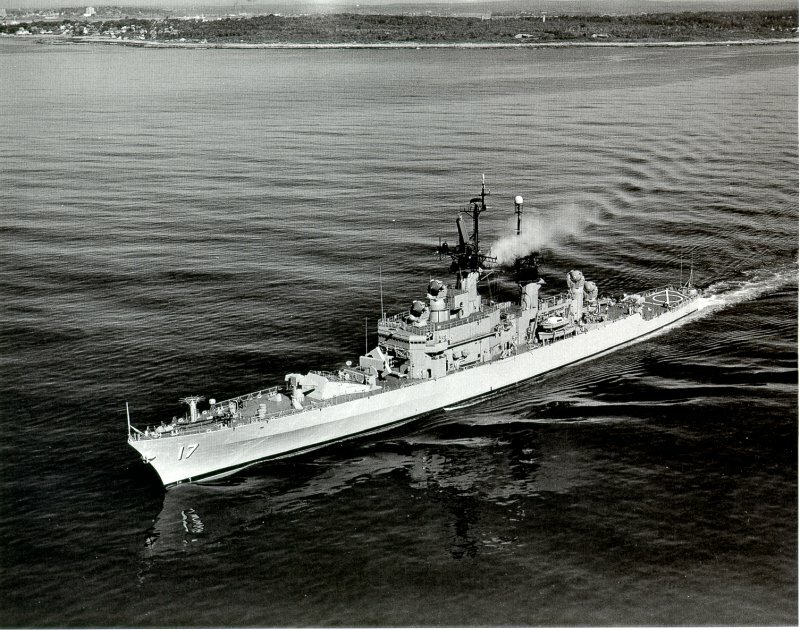 Admiral Yarnell died 7 July 1959 at Newport, R.I., his home since his retirement. 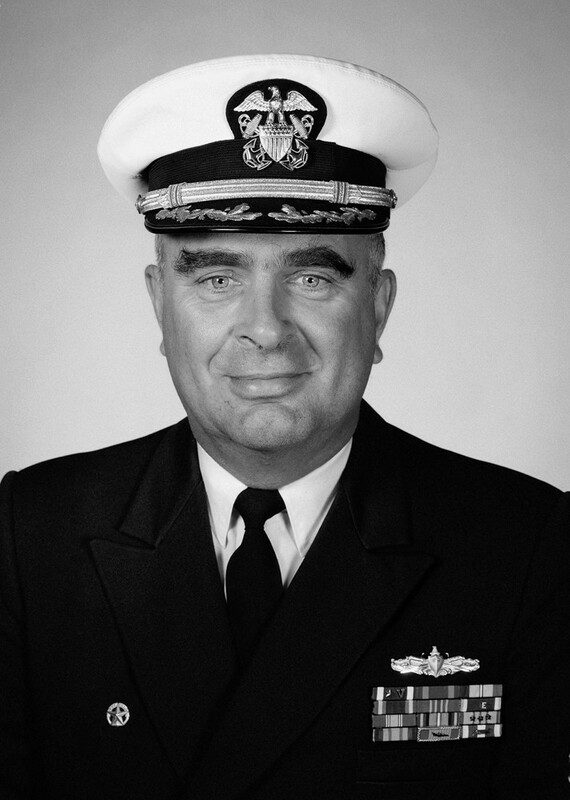 Among the awards and medals earned in his long and distinguished career were the Navy Cross, the Distinguished Service Medal, the Diploma and Decoration of the Companion of the Order of the British Empire, and the Cloud Standard, Second Class, of the Government of China. 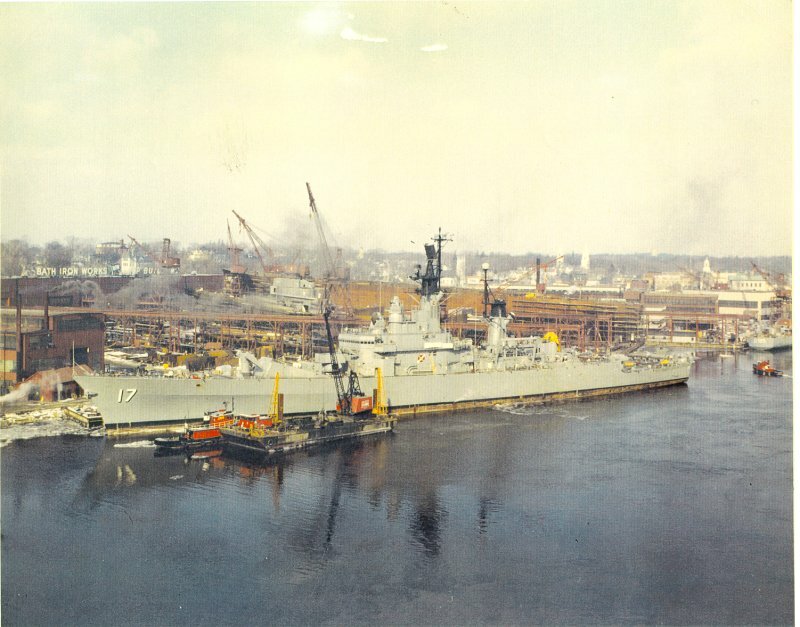 83k Naval Operating Base, Norfolk, August 1964. © Richard Leonhardt. 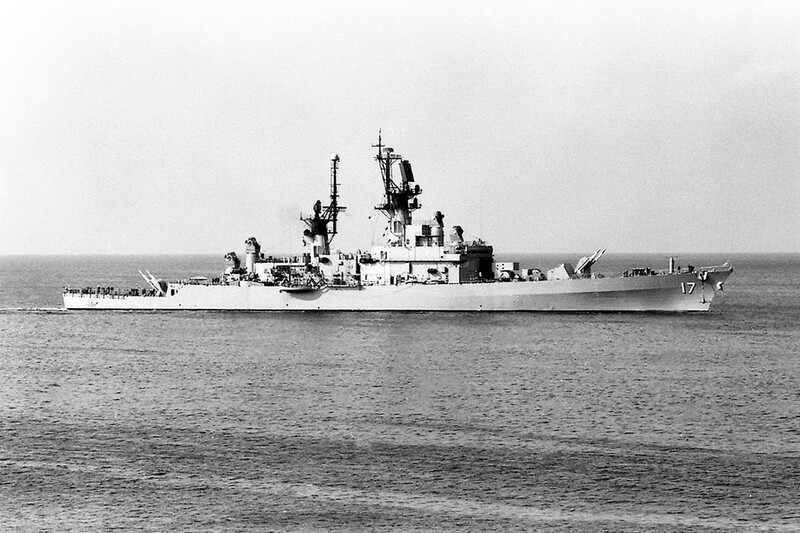 Antwerp, Belgium, 31 March 1984 - A starboard bow view of the guided-missile cruiser USS Harry E. Yarnell (CG 17). 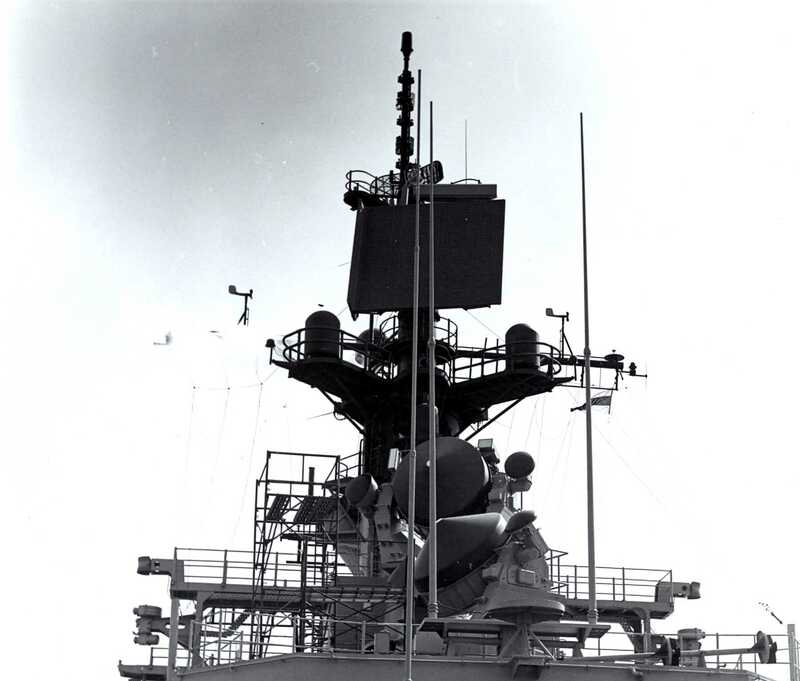 Note the Terrier/Standard-ER (extended range) missiles on the Mark-10 Mod-7 launcher (forward). 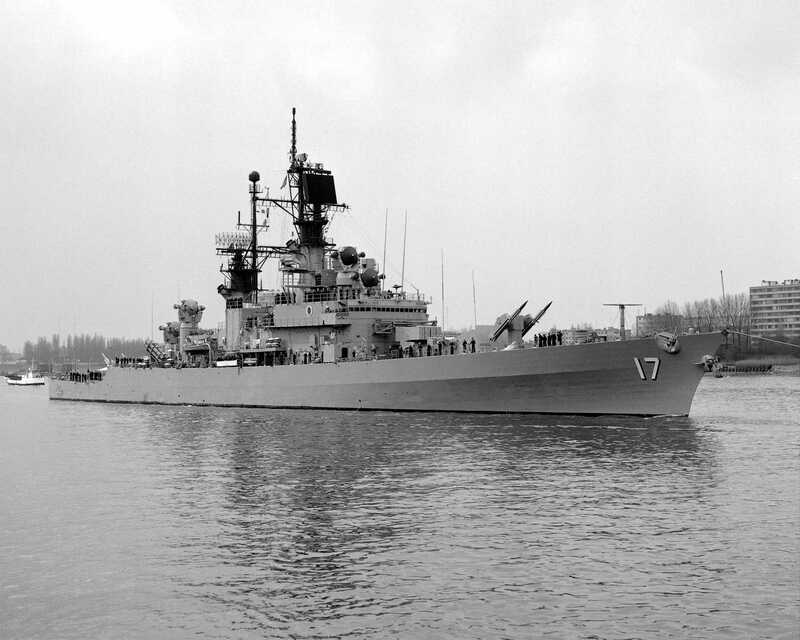 Photo #DN-SN-85-00991 by: Leo Van Ginderen. 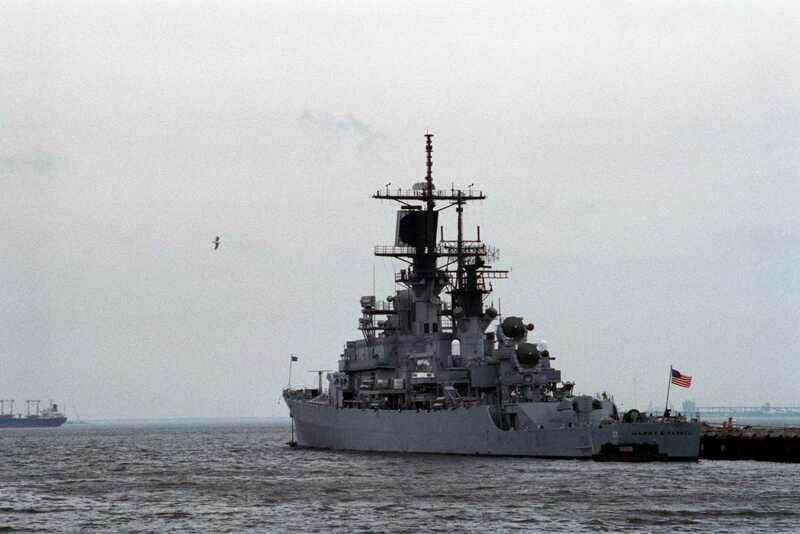 1 February 1986 - The guided-missile cruiser USS Harry E. Yarnell (CG 17) and the destroyer USS Comte De Grasse (DD 974) moored at the destroyer and submarine piers, Naval Operating Base, Norfolk, Virginia. 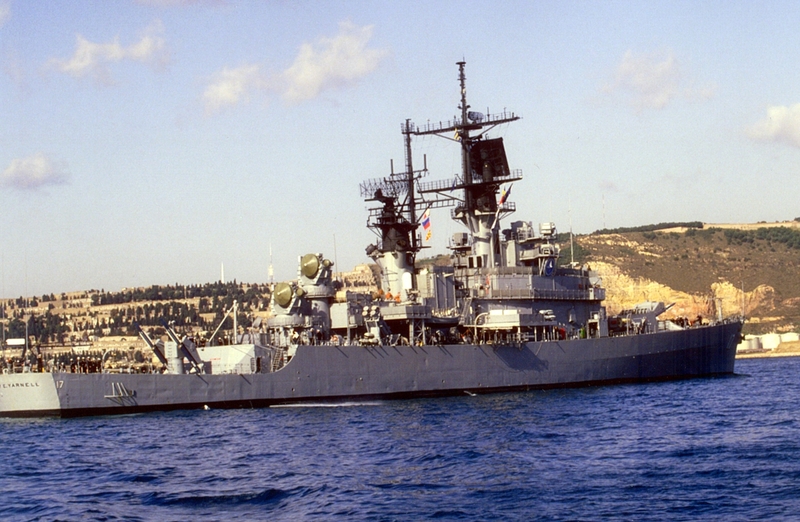 U.S. Navy Photo #DN-ST-88-09171 by PH2 Chris Holmes. 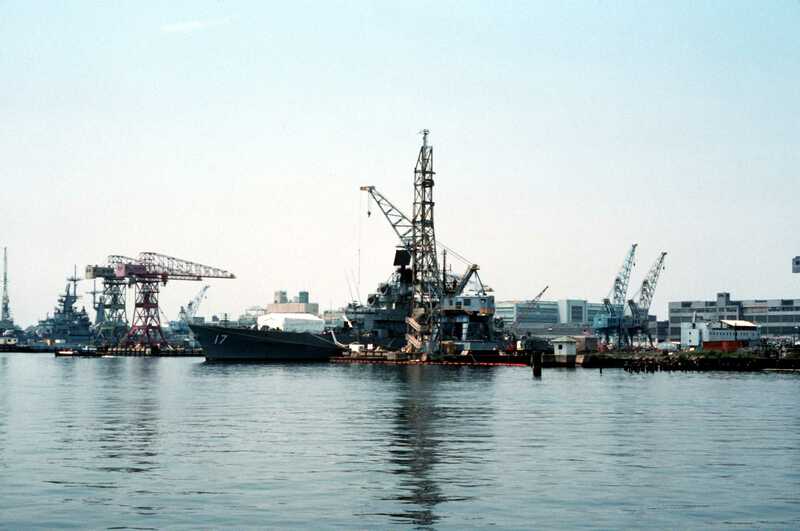 Portsmouth, VA, 7 July 1988 - An overall view of the upper section of the Norfolk Naval Shipyard with a port bow view of the guided-missile cruiser USS Harry E. Yarnell (CG 17) visible on the left. 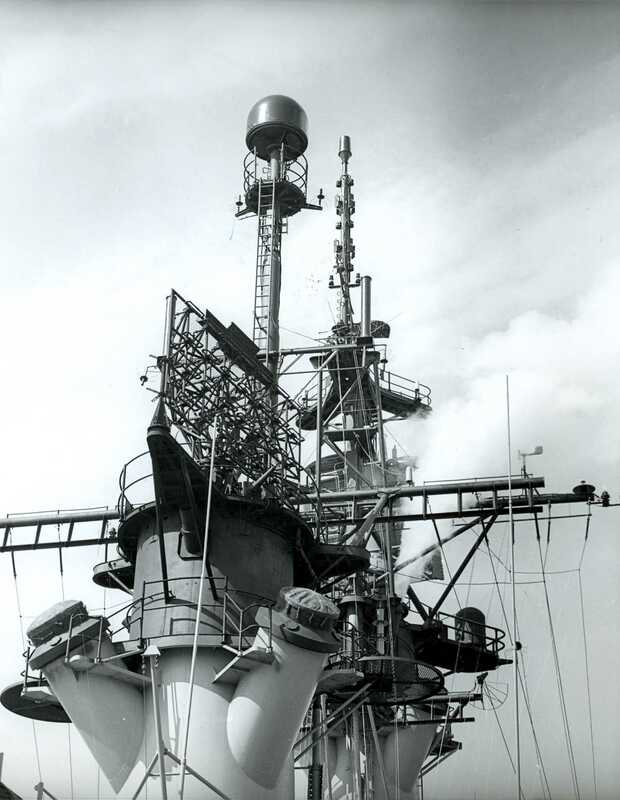 U.S. Navy photo#DN-ST-88-07993 by Don S. Montgomery, USN (Ret). 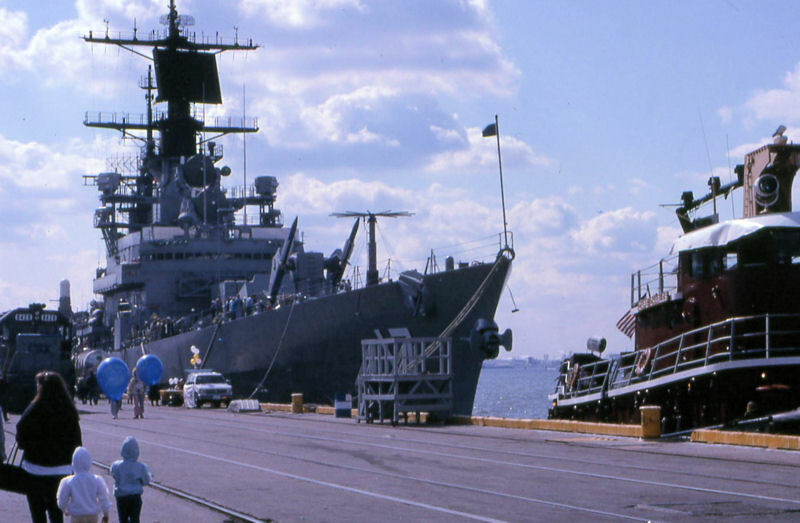 Norfolk Naval Station, Norfolk, VA, 21 JUL 1989 - Officers and crewmen man the rails aboard the guided missile cruiser USS Harry E. Yarnell (CG 17) as they wait for the arrival of three Soviet navy ships. 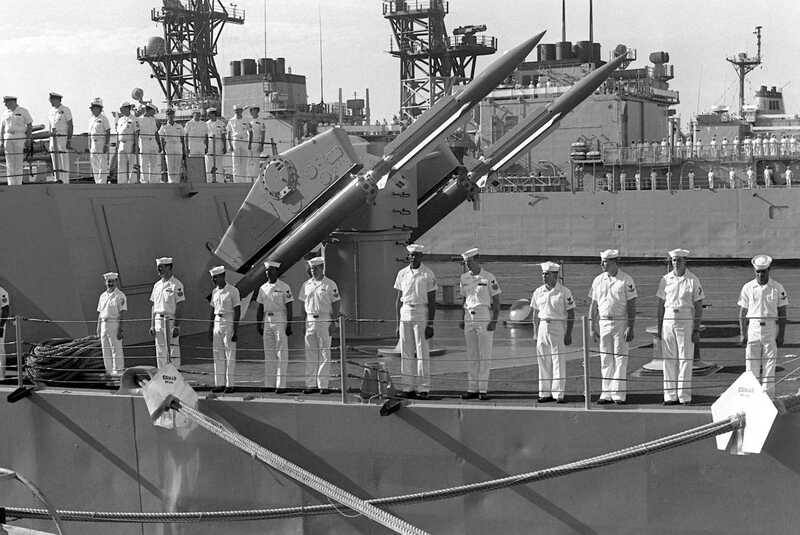 Behind them is a Mark 10 twin missile launcher fitted with two RIM-67B Standard SM-2 ER surface-to-air missiles. 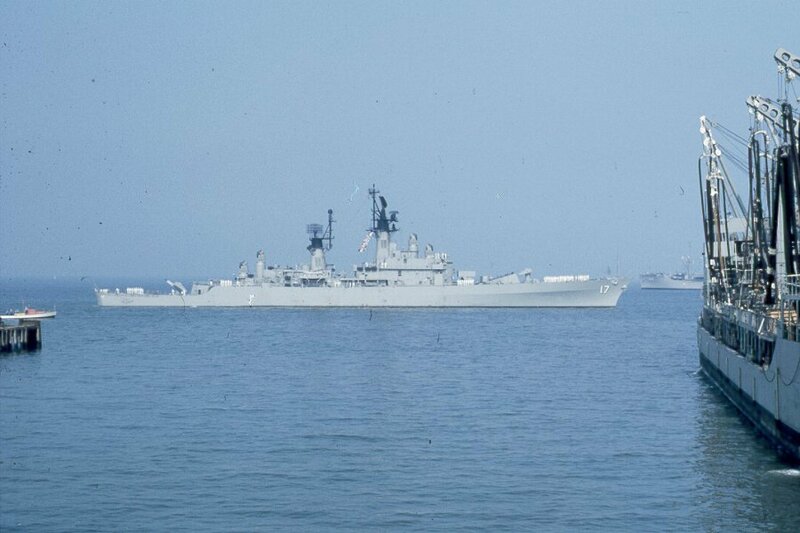 U.S. Navy Photo #DN-SN-90-05380 photo taken by JOSA Greg Your. 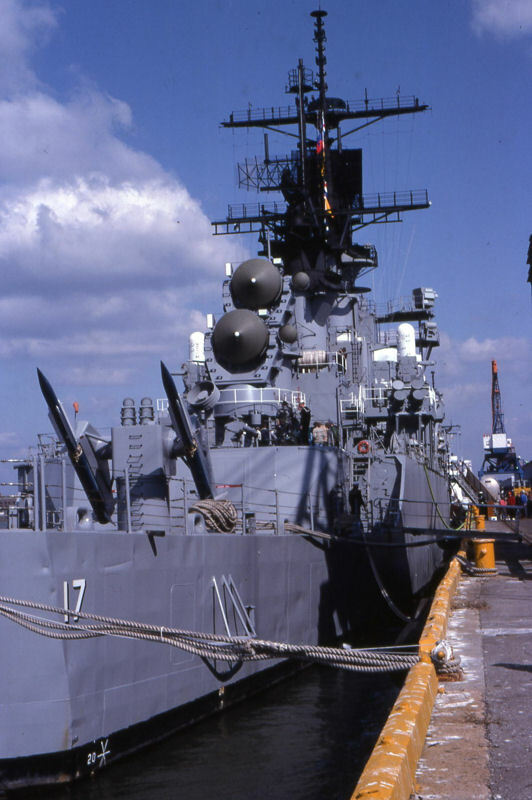 Norfolk, VA, 28 March 1991 - A port quarter view of the guided-missile cruiser USS Harry E. Yarnell (CG 17) moored at Naval Station Norfolk. 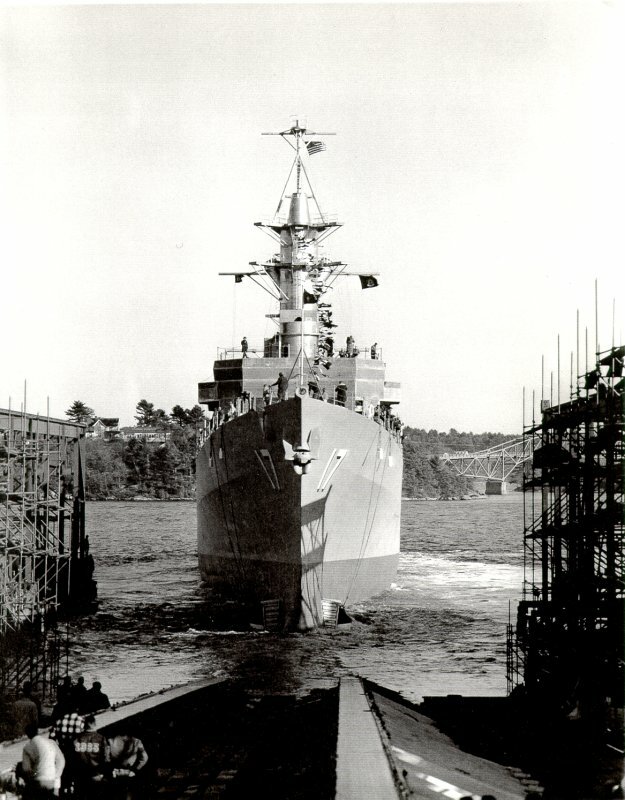 U.S. Navy photo #DN-SC-91-08217 by: Pat Jett Tombs. 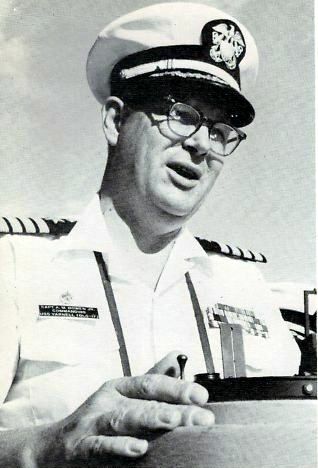 Change of Command booklet, 15 APR 1993. 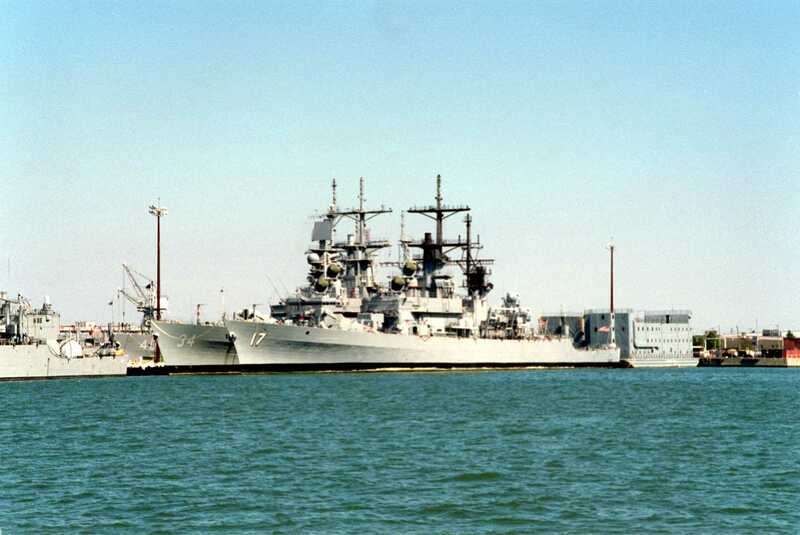 Norfolk, VA, 2 October 1993 - A port bow view of the guided-missile crusiers USS Biddle (CG 34) and USS Harry E. Yarnell (CG 17) nested at the destroyer and submarine pier at Naval Station Norfolk. 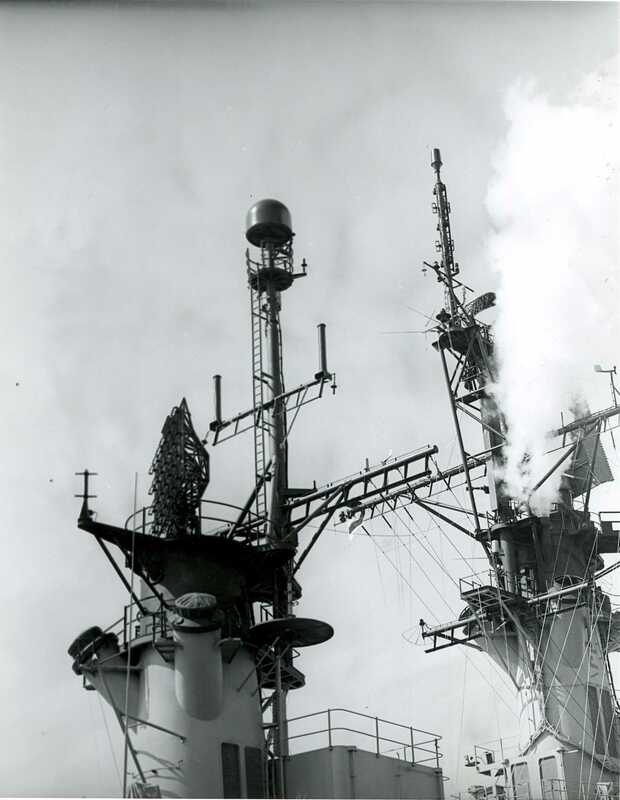 Note that both ships have had their radar antennas removed prior to their upcoming decommissionings. 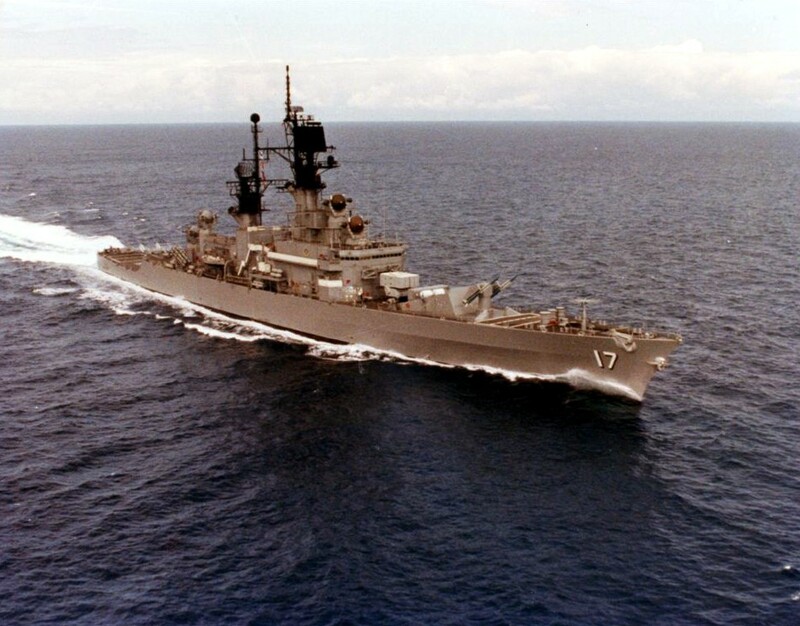 U.S. Navy photo #DN-SC-94-00029 by: Don S. Montgomery, USN (Ret).